ABC News has a law enforcement source telling them that Jesse Jackson, Jr. is “Senate Candidate Five,” the one who was — according to Blagojevich — willing to supply campaign cash in exchange for the Senate seat. Jackson Jr. said he agreed to talk with federal investigators “as quickly as possible” after he consults with a lawyer. The Congressman, a son of the famed civil rights leader, denied that anyone had been authorized to make payments or promises to the Governor on his behalf. 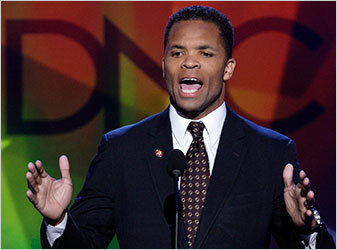 Federal authorities on Wednesday identified Democratic Representative Jesse Jackson Jr. of Illinois as the potential United States Senate candidate who was portrayed in court papers made public Tuesday as being the most deeply enmeshed in the alleged scheme by Gov. Rod Blagojevich to benefit from his appointment of a new senator to the seat vacated by President-elect Barack Obama. Mr. Jackson said in an interview with ABC News that he did not know whether he was the anonymous Candidate 5 mentioned by federal prosecutors in the affidavit supporting their criminal complaint against Mr. Blagojevich. He said that the prosecutors in Chicago told him he was not a target of the criminal inquiry. But he said they had asked him to answer questions about the selection process by Mr. Blagojevich to fill the seat. Mr. Jackson, who has publicly sought the appointment, said he met with Mr. Blagojevich to discuss the job for the first time earlier this week, after not having spoken to him for more than four years. Mr. Jackson said he never authorized anyone to offer anything in return for the appointment. Mr. Jackson, the son of the civil rights leader, was first named by ABC News as the person identified in the criminal complaint as Candidate 5. 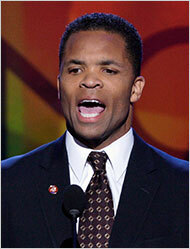 Rep. Jesse Jackson Jr. at the Democratic National Convention in August. Federal prosecutors in Chicago would not discuss the identity of Candidate 5 and would not comment on whether Mr. Jackson would be interviewed in the case. The identify of Candidate 5 has been a mystery since the filing of a legal complaint on Tuesday accusing Mr. Blagojevich and an aide of engaging in corruption and conspiracy, stemming in part from an alleged effort by the Governor to sell off Mr. Obama’s seat in return for campaign contributions and lucrative jobs for Mr. Blagojevich and his family. Of the six candidates for the senate seat who are identified by number in the complaint, but not named, only Candidate 5 is said to have engaged in possible wrongdoing by engaging in discussions through an emissary about a possible quid pro quo with Mr. Blagovich’s camp. The emissary was also not identified by name. According to the compliant, Mr. Blagojevich threatened to appoint Candidate…. You are currently browsing the archives for the quid pro quo category.